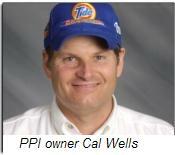 Sunday’s “Ford 400” at Homestead-Miami Speedway was likely the final ride for Cal Wells and his PPI Racing Team. Longtime sponsor Tide announced a few weeks ago that it will leave the team (and the sport) at the end of the season, and Wells has been unsuccessful in securing a new backer for his struggling Nextel Cup team. Sources close to the situation say Wells informed his employees that he will close the doors later this week, after a hoped-for sponsorship deal fell through. Wells came to NASCAR from the CART Open Wheel series in 2000, amid considerable fanfare. He secured sponsorship from both McDonald's and Tide, who had previously backed popular veterans Bill Elliott and Ricky Rudd, and raised the financial bar in NASCAR racing almost immediately. He offered lucrative contracts to drivers, crewchiefs and crewmembers alike, raiding other teams for personnel and earning the ire of rival team owners. 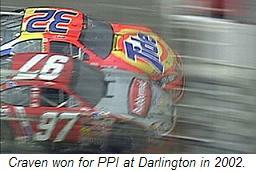 Unfortunately, Wells learned that money alone does not guarantee success in NASCAR Nextel Cup racing. In his seven years of NASCAR competition, Wells went to Victory Lane only twice; both with driver Ricky Craven at the wheel. One of those wins was a truly memorable one, with Craven emerging victorious from a last-lap, fender-banging duel with Kurt Busch at venerable Darlington Raceway in March of 2002. But as a whole, Wells’ tenure as a NASCAR owner was unremarkable. His last Top-10 finish (an eighth) came courtesy of road-racing specialist Ron Fellows at Infineon Raceway in 2005, and this season, PPI Motorsports ended the year ranked a woeful 36th in points, with a season-best finish of 19th. Sadly, Cal Wells and PPI proved incapable of catching up. Next February, Wells and his bright orange #32 “Tide Ride” may scarcely be missed among all the multi-car teams and shiny new Toyotas clogging the garage area. But his absence is worth noting, if only for what it represents. Now, only Robby Gordon, BAM Racing and a rogue’s gallery of part-time backmarkers are left to carry the banner of NASCAR’s once-proud single-car teams. Cal brought quite a few new ideas to Nascar. He made teams more aware of computers, engineers, started the much safer fuller body seat, the first pit crew to wear helmets. It's a shame smaller teams can't field sucsessful teams in the cup series anymore. With the TV ratings going down,and they are no question, things may get bad for everyone.